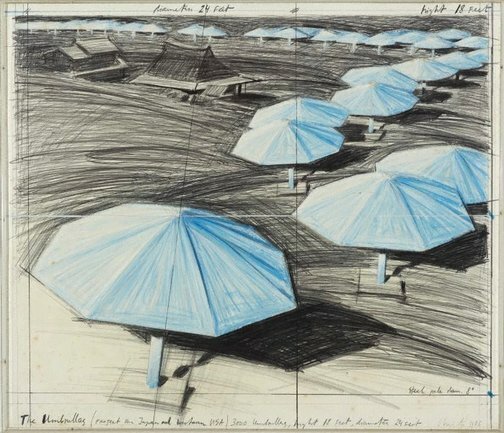 'The Umbrellas' was Christo and Jeanne-Claude’s only cross-cultural project. This $26 million project financed entirely by the artists took seven years to realise and ten months to install. In Japan, 1340 umbrellas were installed on the properties of 459 private landowners and government agencies in Ibaraki Prefecture, northeast of Tokyo. In the USA, the chosen valley was located north of Los Angeles. There, 1760 umbrellas were installed on the properties of Tejon Ranch and 25 private landowners as well as government agencies. The umbrellas were each 6 metres high and more than 8 metres in diameter, extending across 18 kilometres in Japan and 25 kilometres in California. While the umbrellas in Japan were blue, in California they were yellow, each conveying the seasonal colour and light of the region. Their colour and shape reflected similarity and difference and in each country they were assembled in different configurations, sometimes clustered together and at other times spaced out in lines, running alongside rivers and roads, fields and valleys. At sunrise on 9 October 1991, the artists alongside 920 workers and friends in Japan and 960 in California opened the 3100 umbrellas. The umbrellas remained on view for 18 days. Signed and dated l.r., pencil "Christo 1986". Sophie Forbat, John Kaldor family collection: Art Gallery of New South Wales , 'Christo', pg.62-77, Sydney, 2011, 65. From Christo and Jeanne-Claude to Jeff Koons: John Kaldor art projects and collection , Sydney, 1995, 83.